Used to conceal fractured or misshapen teeth that show prominently in your smile. Wouldn’t you rather have a cosmetically enhanced crown that looks natural and blends perfectly with your other teeth? Modern ceramic or porcelain crowns are extremely natural looking and improve your appearance by covering the teeth with a strong material to stop further deterioration. Replacing a gap with a cosmetic bridge not only changes the way you feel it also helps to maintain your appearance by preventing the collapse of facial features that can cause premature wrinkles and age lines. A Bridge is a fixed appliance used to fill the space in your mouth left by a missing tooth and is a more natural alternative to a removable partial denture. Not only can a cosmetic fixed bridge prevent teeth from drifting out of position it can correct an altered bite, improve your chewing ability and your speech. 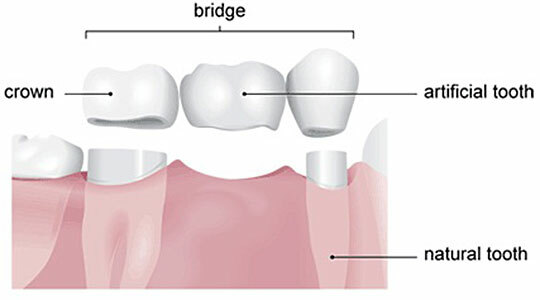 What is more the bridge looks and feels almost exactly like a natural tooth.